Pamela Sudduth is a Learning and Development Facilitator of Literacy for the PS/RtI Project at University of South Florida. She has a diverse background in the field of education with over twenty years of experience. 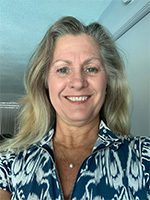 Pamela has a Master’s Degree in reading and a Bachelor’s Degree in Specific Learning Disabilities from the University of South Florida, as well as certifications in English for Speakers of Other Languages, English, and her Reading Endorsement. The preparation has given her a solid foundation in how students learn skills and techniques necessary for success and has provided her the knowledge in understanding all students’ needs along with strategies to support progress. Pamela has experience as an Exceptional Education instructor, secondary English and reading educator, school-based Exceptionality Specialist, and Reading Coach. Additionally, she has experience at the district and state levels. In the district she worked as an Instructional Staff Developer, which led to the position as a Reading Coordinator for the Department of Education. These varied opportunities provided rich, well-rounded experiences in classrooms, schools, and districts throughout the state of Florida.